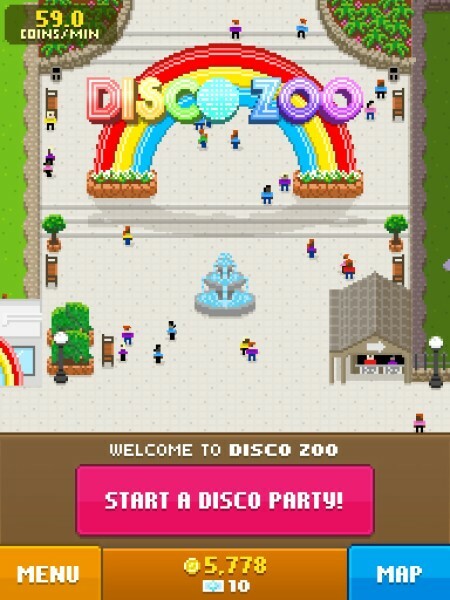 I have yet to find anyone who isn’t compelled merely by the title of this game, Disco Zoo. It’s a resource management game in the form of a zoo, with a quirky disco mechanic which can be triggered by using a consumable in-app currency (called Discobux). The developer of this game, Nimblebit, is a very notable team of two brothers who have made some of the most successful freemium games of all time like Tiny Tower and Pocket Planes. If you’ve played either of those, you will have a basic understanding of how Disco Zoo works: you endlessly expand your real estate and populate it with in-game creatures. The new mechanic in Disco Zoo is a Battleship-like search for animals to populate your zoo with. You uncover tiles to reveal animal shapes underneath them, “freeing” them to populate your zoo. Once you begin to populate your zoo, patrons start hitting you up which replenish coins that you spend while continuing to search for animals. 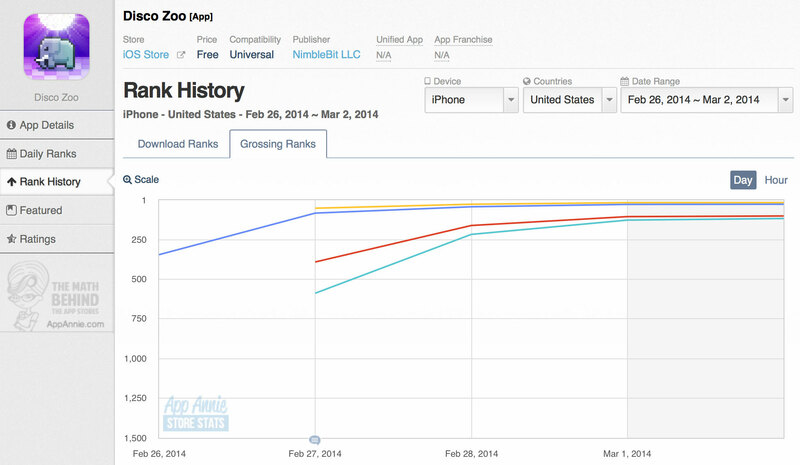 With freemium games of this type, a constant call-to-action is necessary for keeping high engagement. So what is the constantly-nagging element of Disco Zoo? Your animals fall asleep, and when they do, you stop earning revenue on them. This part seemed dark and contrived to me, but it’s almost so ridiculous that is crosses over into entertaining. Push notifications will begin popping up repeatedly asking you to “Wake” the animals to bring visitor revenue back. Ideally your animals will never sleep, will constantly earn you revenue, and will disco dance on command. Much of this games charm derives from the fact that it is ridiculous in so many ways. 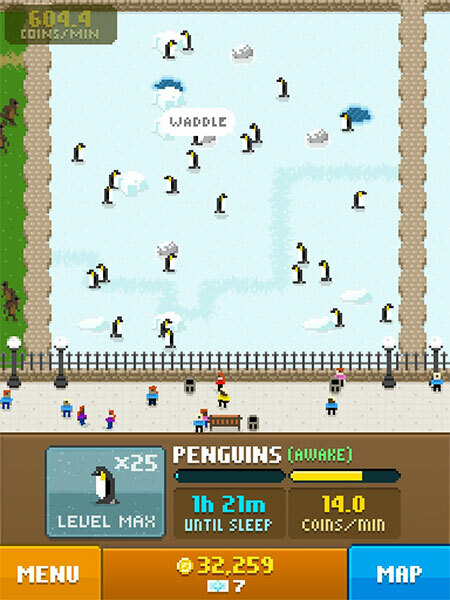 The graphics are bright and pixelated and animals happily hop around their pens continuously. Although Nimblebit are well-respected, many games of this type are criticized and labelled as free-to-wait, and this game is certainly one of those. There’s little to no actual strategy required other than basic pattern recognition in the hunt sequence. No, what this game demands is commitment. Once you develop the habit of striving for the next achievement like upgrading your zoo size, it becomes engrained and you mindlessly perform the same actions everyday. That’s when you know a game has got you. Like Tiny Tower and Pocket Planes, you build and build and the reward is basically the process of building. Other than a leaderboard you cannot compete with others, and there is limited social functionality aside from sharing achievements which there is no real incentive to do. When I showed this game to a friend and he played it, he said that he didn’t even consider this to be a game. I can understand that perspective but the mobile era has tested and broken many preconceptions about what games are. I embrace this new definition and can see the value in time-intensive gathering games of this type when they’re done this well. It’s mindless, charming, and can be played in seconds. But I don’t see it holding up over time. Without introducing major new gameplay mechanics, I will likely lose interest after a few weeks of gameplay. This is exactly what happened with every NimbleBit game before this – for me, they’re a joy for a brief period of time. So far it has yet to break #100 on the Top Grossing charts, which is a lukewarm reception considering it is being prominently featured by the App Store right now. It’ll be interesting to see how this develops and what it does to recent other Nimblebit games which are so similar to this, like Pocket Planes and Pocket Trains.